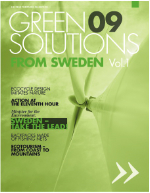 New Magazine – Green Solutions from Sweden! Please enjoy the all new " Green Solutions from Sweden magazine " packed with good solutions from Sweden that makes our environment better. Previous Post Success for Green Solutions from Sweden in Alabama U.S.